All the way from Poland! Recently an intrepid Nintendo Life reporter made the long and arduous journey to visit Polish developer Gamelion, the chaps behind DSiWare hit Extreme Hangman, to check out their upcoming WiiWare roll ‘em up Furry Legends. With the first instalment currently awaiting approval from Nintendo there was plenty to get our teeth into, and the chance to get some answers about the title and its recently announced follow-up too. For those of you unfamiliar with Gamelion, studio VP Sebastian Szczygiel let us in on a little of their history. With a wide back catalogue of mobile games, including ports of LocoRoco, Tiger Woods, FIFA and more, the company’s got plenty of experience in different technologies, but recently made the move into creating its own new IP. 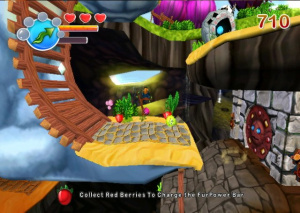 Although still developing for mobile devices – in fact, Furry Legends: Beginnings is already available on Verizon in North America and will be ported to DSiWare later this year – Nintendo consoles now feature heavily in the company’s future plans, with its first release, Extreme Hangman, recently topping the US sales charts for DSiWare, much to the company’s surprise. Following a brief introduction to the game we picked up the Remote and Nunchuk and got stuck into the side-scrolling action. Sure to spark up feelings of warm nostalgia in gamers who grew up with classic 16-bit platformers, Furry Legends puts a new spin on familiar 2D territory by putting you in control of a ball rather than the usual bipedal hedgehog, plumber or bobcat. Using the Nunchuk to manoeuvre, [A] to jump and [B] to activate special powers (more on them later), it’s as straightforward as you’d expect, with a dash-attack activated by holding a direction and shaking the Remote. There’s no lock-on so it takes some skill and judgement to line up attacks correctly, but once mastered it opens up new possibilities for clearing stages. Each level takes anywhere from ten minutes upwards, with a mixture of combat, physics-based puzzles and sheer platforming skill standing between you and the exit. 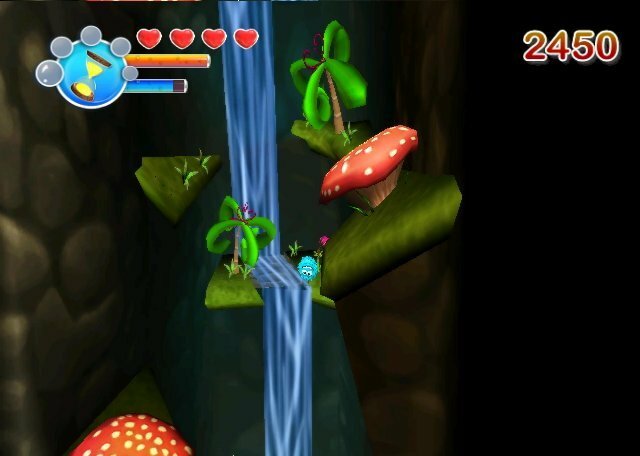 With each successive stage getting noticeably harder – even the second level has its nightmare sections! 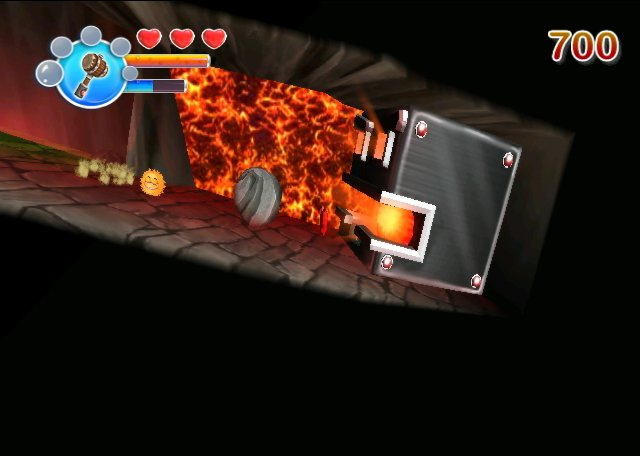 – and introducing new features, there’s plenty of variety packed into the game’s five levels. As you progress new characters are unlocked, each with their own powers including super-speed and the ability to slow time, meaning you can return to earlier stages to access previously unavailable areas for power-ups and other bonuses. 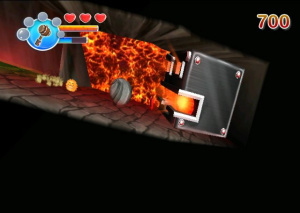 As you’ll have seen from the screenshots, Furry Legends is a nice-looking title by WiiWare standards, and it certainly did the business on the huge projection screen we played it on. Smooth, crisp and featuring plenty of character, it certainly evokes fond memories of old-school gaming, all wrapped in an accomplished 3D engine, with bloom, realistic physics and particle effects all present and correct. One of the most surprising elements of the game is the amount of humour packed in. Far from being full of childish jokes, the developers wanted to create something that would be safe for kids but that older gamers could enjoy too. We saw countless references to classic game franchises (including a rather cool Tetris mural) as well as plenty of Terry Pratchett-esque passages and even an unexpected appearance from a set of Hispanic inquisitors. Some of it is naturally hit-and-miss but there’s sure to be something to raise a smile on even the most crusty old gamer’s face. There was plenty to enjoy about Furry Legends: although experienced gamers will undoubtedly finish the game reasonably quickly, there’s enough hidden humour, power-ups and even an extended ending awaiting those prepared to explore the game’s stages fully. We certainly enjoyed our time with Furry Legends, and with the game now resting with Nintendo it hopefully won’t be too long before it’s available to WiiWare customers everywhere. Stay tuned for exclusive interviews with the game's producer and level designer, shedding yet more light on this promising platformer. This article is based on code submitted to Nintendo for approval. Details and screenshots are subject to change. Looks impressive from what I've seen and heard. I wonder how many wii points it will be 1000? Also, I wonder how short it will be, or what extra bonus or modes they will incorporate if any. One of my most anticipated WiiWare games will finally, FINALLY, see the light of day. They have already said that it will be at least 2 episodes because they couldn't get everything they wanted to in the 40mb WiiWare limit. Wow, the title of the game put me off but from reading your article it looks like a good buy albeit a small game. Hopefully it's cheap! EDIT: As the points it will cost is determined by Nintendo, we won't know how much it will cost until after it gets approved, I imagine. This looks like an INSTA-BUY for me! It will probably end up being 800-1000 per episode. So far they seem to be doing a great job. This game is awesome. How many side scrollers are coming out on WiiWare this year? Lots. That's how many. And I want them all. One of my instas. Dsi and Wii wares.